Gorobets, A.; Trias, F. X.; Borrell, R.; Soria, M.; Oliva, A. This work is devoted to the development of efficient parallel algorithms for the direct numerical simulation (DNS) of incompressible flows on modern supercomputers. A Poisson solver for problems with one uniform periodic direction is presented here. It is extended with a two-level hybrid MPI+OpenMP parallelization. Advantages and implementation details for the additional OpenMP parallelization are presented and discussed. This upgrade has allowed to significantly extend the range of efficient scalability. Here, the solver has been tested up to 12800 CPU cores for meshes with up to 10 9 nodes. However, estimations based on the presented results show that this range can be potentially stretched beyond 10 5 cores. Gorobets, A. [et al.]. 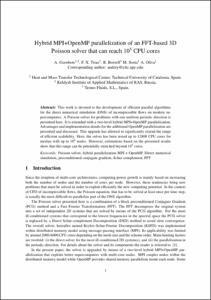 Hybrid MPI+OpenMP parallelization of an FFT-based 3D Poisson solver that can reach 100000 CPU cores. A: International Conference on Parallel Computational Fluid Dynamics. "Parallel CFD 2011 : 23rd International Conference on Parallel Computational Fluid Dynamics". Barcelona: 2011, p. 1-5.